Hydrangeas have enjoyed a comeback in popularity over the last two decades. One of the most hybridized plants, Hydrangeas are available in an astounding array of sizes, shapes, and flower color. Every garden in Bucks County should have at least one Hydrangea. Blooms periods range from late spring into summer and fall, so most Bucks County landscapes will benefit from several Hydrangea species and cultivars incorporated into a landscape design. Their requirements are similar throughout the range of species and cultivars. Part shade and protection from afternoon sun and a rich, moist and well-drained organic soil provide the optimum conditions. They will tolerate more sun if adequate moisture is available. Clay soils should be amended with plenty of compost or replaced with high organic topsoil prior to planting. The most common Hydrangea seen in Bucks County is Hydrangea macrophylla, or Bigleaf Hydrangea. These shrubs may range from a compact 2’ tall and wide shrub such as Hydrangea ‘Pia’ to the larger Hydrangea ‘Nikko Blue’ which can reach 6’ in height and width. 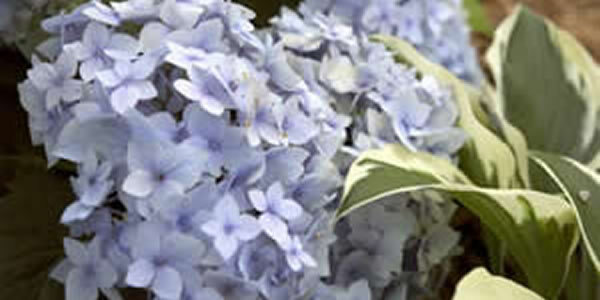 The Bigleaf Hydrangeas are divided into two categories; Hortensias and Lacecaps. The Hortensias, or ‘mopheads’ are noted for their large, rounded clusters of white, blue, pink or red flowers. The flowers are often so large that the plant stems bend to the ground. The Lacecaps are similar, but have an inner ring of very small, non-showy, fertile flowers and an outer ring of flowers that open wide, giving the plant the lacy-look that its name implies. A bi-color effect is often evident in the Lacecaps, providing a more subdued yet beautiful flower show. Pruning should take place after flowering. Pruning later than August will remove next year’s flowers, as the plant produces flowers for the following year in late summer/early fall. The ph of the soil will affect the flower color of these plants; low ph, or acidic soil produces blue flowers, while high ph, or alkaline soil produces pink flowers. Recent developments in cultivar selection of Bigleaf Hydrangea have produced the Endless Summer series of Hydrangeas. These plants, unlike other Bigleaf Hydrangeas, bloom more than once per season, and are more forgiving to pruning times and less susceptible to winter die-back. Hydrangea ‘Endless Summer’, Blushing Bride’ and ‘Twist-n-Shout’ are three named cultivars. These Hydrangeas are extremely hardy, and will thrive in Bucks County landscapes. The Endless Summer series is the exception to pruning, and will still flower if pruned in the spring. Two other Hydrangeas worthy for inclusion in your landscape design are Hydrangea quercifolia (Oakleaf Hydrangea), and Hydrangea paniculata (Panicle Hydrangea). Both have white flowers that often fade to pale pink. Oakleaf Hydrangea has oak-shaped leafs that turn a beautiful red, orange and purple in the fall. The large white flowers open in mid-to-late summer and persist for several weeks. Panicle Hydangea has similar flowers, also blooming in summer; the cultivar ‘Tardiva’ is spectacular in bloom. The Panicle Hydrangea cultivar ‘Grandiflora’ is also grown and grafted into a ‘standard’ or small tree form which makes a very nice patio tree for landscape use. Both Panicle and Oakleaf Hydrangea will exceed 6’ in height. They bloom on new growth, so pruning may be done in the spring, or after flowering in the fall. Finally, another Hydrangea that will add beauty to your landscape is a vine; Hydrangea anomala petiolaris (Climbing Hydrangea). This vine is great for partially shaded areas and will sprawl on the ground until it finds a vertical structure to climb. There are many examples Climbing Hydrangea in Bucks County that have reached over 25’ in height. They will climb trees, walls, and trellises yet are not overly aggressive like English Ivy. Their white flowers are fragrant and stunning as they light up a shaded area. The most frequently asked question on Hydrangea care; why don’t my Hydrangeas bloom? This almost always applies to the Bigleaf Hydrangea, with the lack of bloom resulting from either pruning at the wrong time, or the flower buds being killed by a late freeze. As a rule of thumb, only prune when the plants have finished flowering. Hydrangeas should be selected for hardiness- the Endless Summer series is a great choice for Bucks County, and will withstand our coldest winters and still bloom. Lack of flowers on the Panicle Hydrangea and Oakleaf Hydrangea is very unusual, so these are great choices as well.